It’s themed furniture day! Today’s theme is “Knockoff” or “Inspired By”. 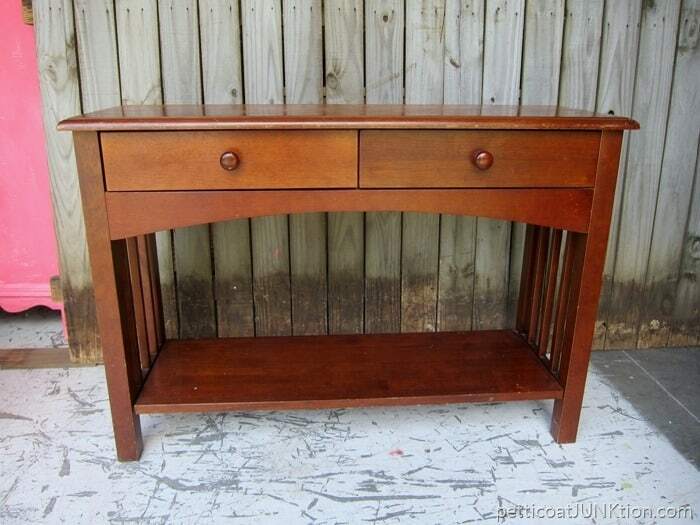 My makeover was inspired by a mid-century style nightstand I spotted on West Elm. Super easy project adding just a bit of paint and cleaning up the original finish. Win-Win for both sides of the painted furniture issue! 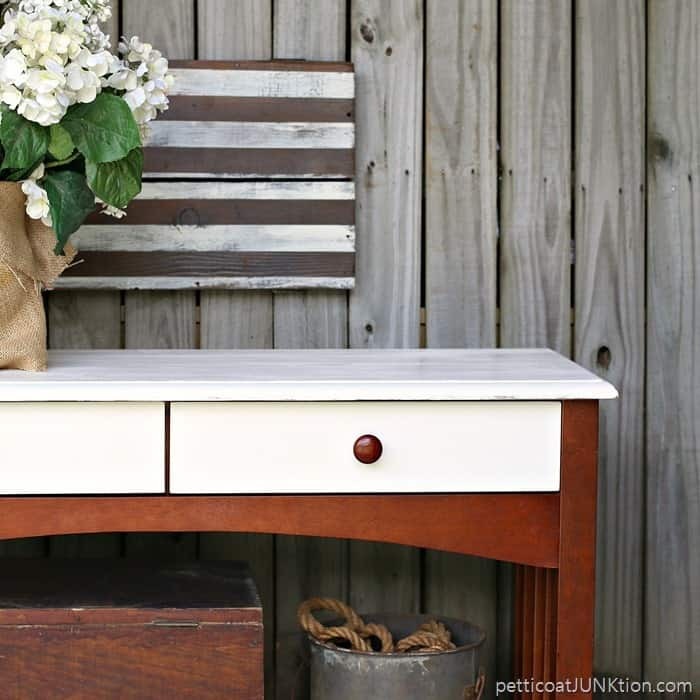 I really like the white paint and wood two-tone finish….so fresh and clean. My project table is not mid-century modern but it’s what I had to work with and it needed a makeover. This is the top of the table. I either had to paint the top or refinish it. No question about what I was going to do. I used Reclaim paint in off-white. 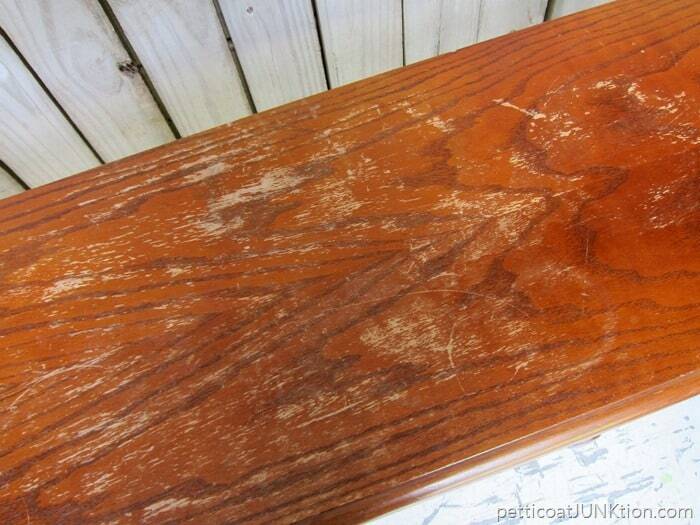 The photo above shows the table with one coat of paint. There were just a few minor scratches and dings on the legs, shelf, and frame of the table. I took care of those easily with a furniture marker and Howard’s feed n’ wax. That white perked the table right up. I know this table has a modern vibe but I had to use a few of my junky, rusty, treasures to stage the photo. That’s just me. I use Reclaim Paint a lot! 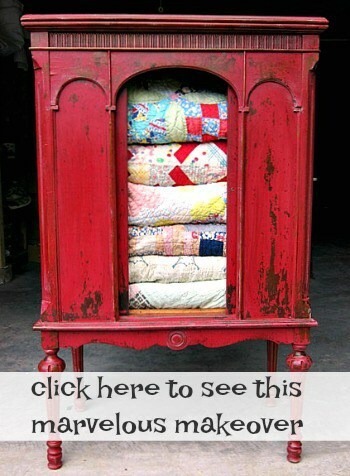 You can find more of my Reclaim projects here….15 Beyond Paint Projects. 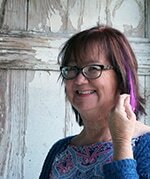 I think you will enjoy my video on How To Paint And Distress Home Decor…..
Time to see what my friends have for us today. Just click those photos below. I’ll see you guys next week. Have a great weekend! Your table turned out beautifully! I love the pop of white. Thanks for sharing your makeover with us at Merry Monday this week! beautiful job Kathy! 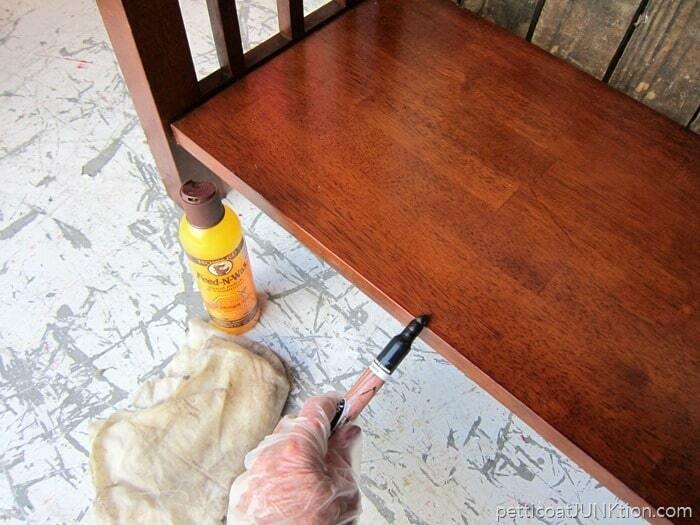 I love 2 toned furniture paint colors. Thanks for linking up to talk of the town! 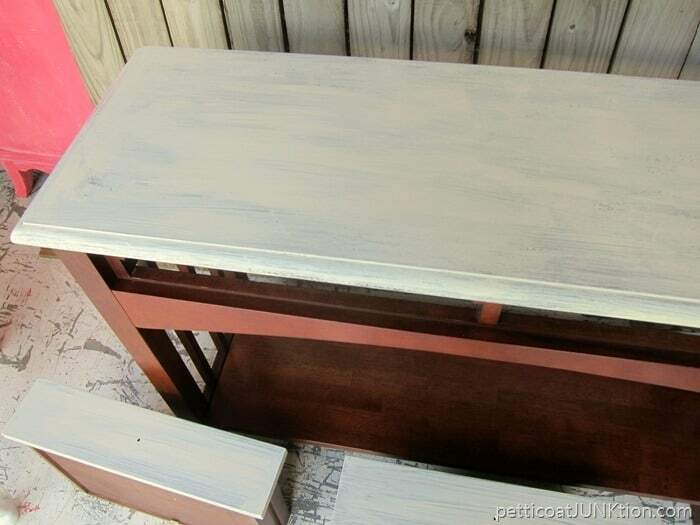 Wow Kathy, I can’t believe how just a bit of white paint completely transformed this piece! Love the way you styled it for the photos too! Beautiful! I love the combination of paint and wood. That is one gorgeous, good-lookin’ table! I love the contrast between the polished wood and the white drawers. It is one of my faves you’ve shared. You get a “10” for effort and a “10+” for beauty! I too thought your table was the inspiration piece! Great looking project! I thought your table was the inspiration piece! Simple project, great look. 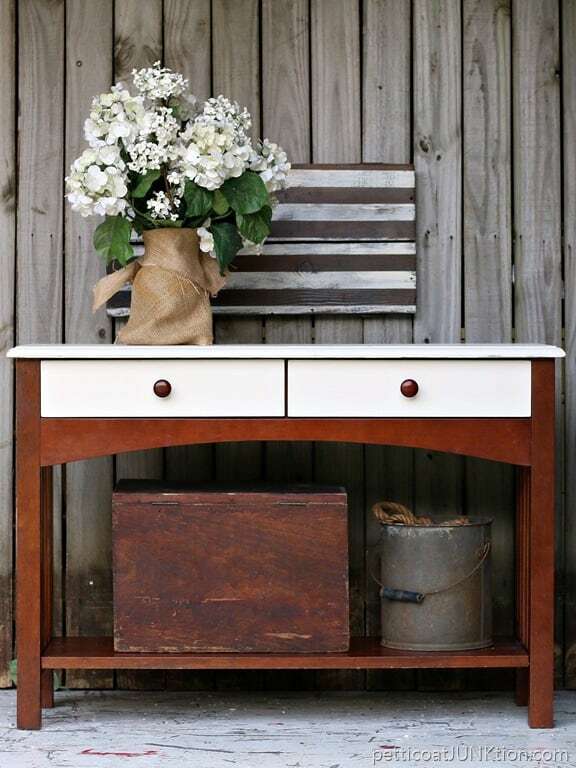 You found the perfect piece for this theme and I love it staged with your own junky, rusty goodness touches! 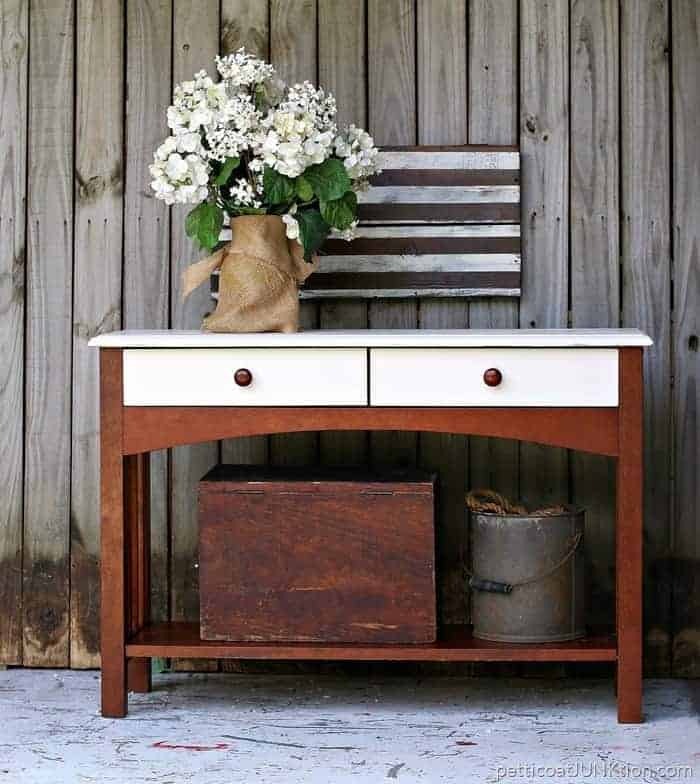 Wood and paint mixed like this is one of my very favorite kinds of furniture! I love your mix of old and new. You took a beautiful piece and made it perfect for you, that is inspiring! Looks great! I was curious about the Reclaim paint and checked it out. I think the Reclaim Buttercream paint is just what I have been looking for to redo my small kitchen table. Double thank yous fur this post! Gorgeous! Love the two-tone look. Such a pretty table! You made it look brand new! Love the new look and even more with the items you staged it with Kathy! Your piece is perfect for this look too. I have that Howards product too, I should pull it out if it will make my furniture look as good as yours!